Every day, thousands of people bid their money in eBay auctions, but on Friday, tech fans had the opportunity to get their hands on something unique and particularly valuable. 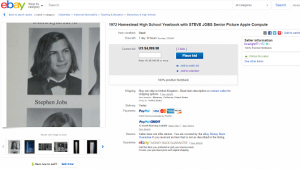 eBay user, “bcwright77,” based in Monterey, California, is selling an allegedly authentic and “extremely rare” copy of Homestead High School’s yearbook from 1972. Here’s the kicker: The yearbook contains an photograph of none other than a youthful Steve Jobs, the late co-founder and CEO of Apple. With a starting price of $4,999.98 (excluding shipping), this “historical collector’s item” is a great purchase to “brag about” for any tech fanatic. Shown on the eBay website, the yearbook contains a very striking image of the then-long-haired Apple co-founder in his senior school year. “This is surely one of the most nostalgic pieces of “Steve Jobs” memorabilia you can possibly find and the perfect gift for any “Steve Jobs” enthusiast,” said bcwright77, who has a “100 percent positive feedback” rating, on the eBay website. Although the auction has been online since March 11, only on Friday did an eBay buyer place a bid. According to “Cult of Mac”, a “buy it now” price was originally set at $12,999.98, but there were no takers. Now the auction has now started, there is now no limit on how much this yearbook could go for. There are plenty of other yearbooks of the famous on Ebay. For a “buy it now” price of $10,064.99 (down from $12,500), you can get a George Washington High School, Va, yearbook signed by school attendees including U.S. musician Jim Morrison. Or how about a yearbook with Bill Clinton’s autograph ($8,500) or one with astronaut Neil Armstrong’s signature, for only $5,499.99?